Fake eyelashes are a great way to add a little something extra to your regular makeup routine. A full strip of eyelashes is quicker and easier to apply than the little individual falsies. Strips of fake eyelashes are extremely varied in the kinds you have to choose from! Some are relatively short, like natural eyelashes, others are much longer. Some are subtle and sparse, while others are thick and full. They range in color from the lightest brown to the darkest black. Some of them even have crazy colors like red or blue or purple. There are even specialty eye lashes that have glitter or tiny rhinestones on them for real “oomph.” Other specialty eyelashes are made of other material like feathers. The first step is to do your regular eye makeup. Use a beautiful eye shadow, and possibly a highlighter at the brow bone and inner corner. Then, apply your eyeliner. The best type is a pencil or kohl eyeliner that you can smudge after application. This will help to make the line of the strip of fake eyelashes less noticeable. Next, run the base of the strip gently through the eyelash glue. The base should be well-coated, but not dripping with adhesive. Do not apply right away! Let the glue dry – not all the way – just a little. It should dry just enough to be a little bit sticky or tacky. Then, using your fingers or preferably a pair of tweezers, line the eyelashes up with your eye. Then place them, not squarely on the eyelids or attached to your own eyelashes, but right at the place where your natural eyelashes meet your eyelid. Hold them there for about ten seconds, until they begin to dry. Then you can let go. Wait about a minute before you work on your other eye, so that you don’t accidentally knock the first set of eyelashes askew while they are still drying. If you like, add a bit of liquid liner to further disguise the eyelashes AND add more drama. Then, also optional, some mascara. Use your own judgement for that! 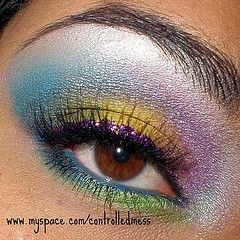 This entry was posted in Glitter Makeup and Nails and tagged costume, eyelashes, fashion, hair, makeup on January 2, 2009 by admin.